Directions: The best views of the lake are from the many small inlet beaches along the shore line, or for greater vantage, walk a few miles away and up from Floe Lake. The lake is a physical challenge to reach with 715m of vertical ascent by foot along a 11km trail. The Floe Lake Trailhead starts in a clearly signposted car park along Highway 93 (Kootenay Highway) in British Columbia, Canada. The closest sizable town is Banff to the East, which is a short 45 minute drive or Calgary which is 2 hours. It was becoming late in the season when I reached Floe Lake, it was early October and I was lucky not to be trudging through snow due to the dry spell at the time. I arrived late in the evening and so did not get much of a chance to photograph at sunset. Although, Floe Lake is the perfect place for sunrise photography as the towering 900m tall rockwall faces almost directly East. I woke early in the morning to sub-zero temperatures (Celsius), set up my bulky and sturdy Manfrotto Video Tripod, and tried to stay warm. The air very clear as winter was just around the corner and at an altitude of over 2000m, the conditions were ideal for ultra-sharp photographs. Dawn provided the best scene for me, giving the striking rockwall a mystical but subtle shimmer. The photo was taken with a Canon 550D, Canon 10-22mm @ 11mm, f/8, 1/50sec. A wide-angle lens is almost a necessity here, enabling the entire rockwall to be captured, as well as fitting in some classic Canadian foreground. Other than that, the entire area is littered with great places to photograph the lake to get some variation. Autumn would be a great time to visit as the trees here show beautiful fall colours. I was slightly too late in the year for the full splendor, with most of the Deciduous trees having lost their leaves. September would be ideal in my opinion. There are also several camping bays a few hundred yards from the lake shore, providing the perfect spot for an early morning rise and to capture dawn and sunrise! 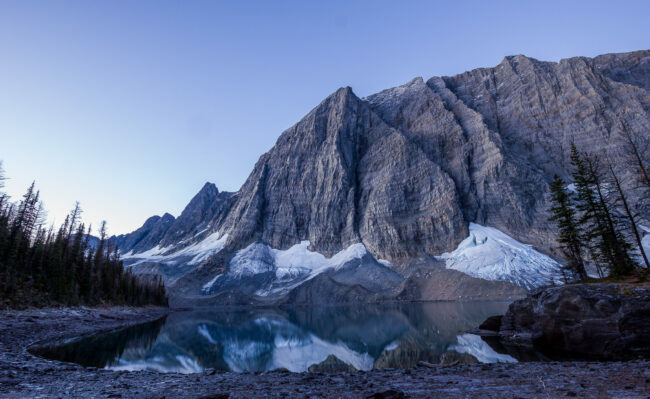 Floe Lake is just location along a 55km trail that follows the length of the rockwall in Kootenay National Park.